I contacted some people to see if any of Ana's siblings would be retiring as well, and the response that I received was disheartening. The likelihood of any of Ana's brothers & sisters being rescued was slim to none. I know it is a long shot, but I am hoping that Kenney will find a soft spot in his heart for Aurora if she is cat safe. I would love to have one of Ana's siblings... and she is black, so no allergy problems! We had been talking about adopting another one eventually and I think Aurora would be perfect. =) We wanted to wait a few years and adopt another one so their ages were more staggered (both Ana and Blue were born within a few months of each other and are 3). But I would just die if we could adopt Aurora. Anyone want to take bets on whether or not I will be able to convince Kenney of that? 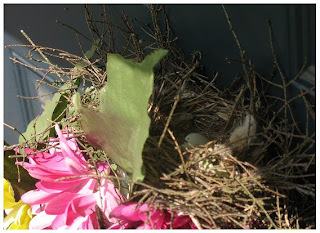 Other interesting news... a mother bird has built her nest at the top of a grapevine wreath that I made that is hanging on our front door. We never use the front door because we park in the back, so I guess she felt comfortable with nesting there. She actually gets blocked from view pretty well because there is a leaf from one of the flowers on the wreath that blocks her from view. She has obviously been there for a while and we never noticed before! We heard some chirping yesterday, and I went to go investigate. Sure enough... there was a little bird sitting on a little blue egg. I don't know what to do though, because the egg hasn't hatched yet, and we are moving in a few weeks. 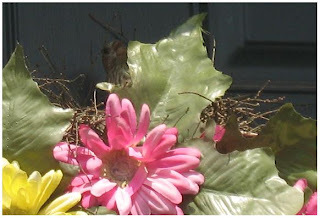 Here is Momma bird peaking at me from behind her protective leaf. Here is the blue egg that she has been sitting on. 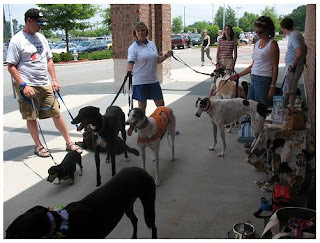 We also had the June VAGA Meet & Greet on Saturday. One of VAGA's newer members, Sharon, was able to come with her daughter, Marissa, and their 3 greyhounds: Dillon, Pearl & Wally. It was very sunny and a little warm, but we were still able to stay outside which is nice because you get more traffic there. We took turns cooling the greys off inside Petsmart. Pearl and Dana are twins! Pearl even almost has a Bindi dot like Dana's. Everyone cooling off in the shade of Petsmart. We never did find out anything about Stella's siblings. Lucas took up so much space in the womb that he only had one sibling. 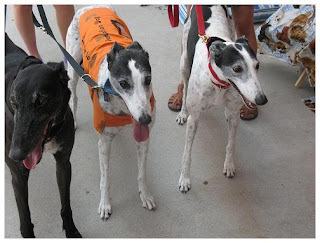 We check the greyhound database every now and then to see if any of their siblings are adopted out. Tell Kenney it's not a sign of weakness. I do not regret getting my third grey. Jaime is an absolute sweetie.